Would you like to have such a view into an idyllic natural Black Forest landscape where you can hear the murmuring mountain brook? Then you are welcome! We are offering 2 holiday apartments with separate entrance. The ground-floor apartments are functionally furnished and offer space for 1-2 persons and 1-4 persons respectively. In front of the apartments there is a sunny, partially covered terrace and a wide idyllic lawn which is bordered by the mountainbrooks "Hirschbach" and "Grosse Enz". 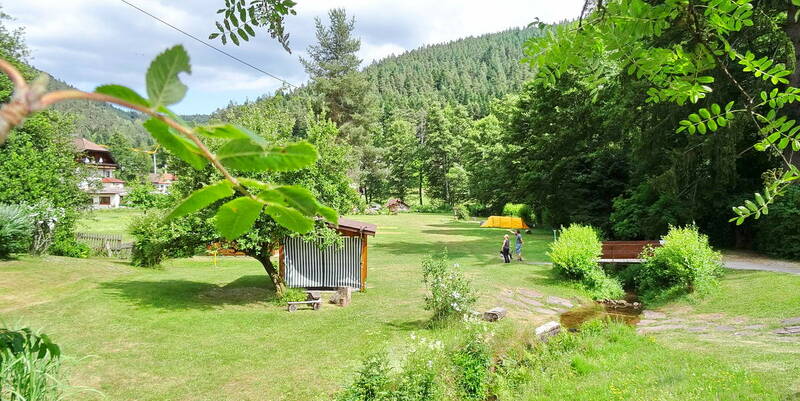 You do not see any neighbouring houses, you do not hear a loud street but you are within the pure Black Forest nature. Only some tents on our car-free tent area may be visible in the distance during the summer months. On the terrace there are places to sit and a table. A parking area is reserved for your car in front of the reception office (35 meters). The holiday apartments are situated in a distance of about 30 meters from the front part of the car-free tent area (have a look on the map). On the tent area a small sunny playground for children is located (70 meters) as well as a playing area at the brook "Hirschbach" where children may easy to get to (30 meters). for 1-2 adults with 1-2 children.